Travis and Allison met while taking a biology class together at Virginia Western Community College. They both connected through shared laughter from a "quirky" teacher and began a journey together that extended "from the classroom to the alter." Though Allison suffers from a chronic auto-immune condition called Juvenile Dermatomyositis, she would like to be an example to other young women in her position. Despite daily challenges, Allison still found a fairytale love story; her time with Travis is a testament to that. Travis proposed to Allison on a cold, snowy night in January, exactly a year after he had first told her "I love you." The two were alone at the Roanoke Star, watching the city light illuminate the scene below. Allison knew that something special was about to happen, and, sure enough, it did. The two started their "forever" together in one of their favorite places. Travis and Allison decided to have a winter wedding with a "fire and ice" theme. They decorated the venue with Christmas lights, candles, and even included a couple fire places to keep the party warm and inviting. The couple's wedding colors--ivory, eggplant, lavender, deep red, and gold and silver--really complimented the warm, cozy feeling. It was important to Travis and Allison that their wedding be comfortable and kid-friendly. As such, they didn't serve alcohol, but instead included a fun drink bar brimming with hot chocolate, cider, coffee, and tons of delicious toppings. For "shots," the bride and groom had shot glasses filled with milk and warm chocolate chip cookies. To give the guests lots of variety, Travis and Allison complimented their small wedding cake with seven different kinds of mini-cupcakes. Additionally, food was served in various locations so that guests could mingle with each other without having to worry about formalities. Adding to the winter theme, guests signed Christmas tree ornaments rather than a guest book, and the bride wore a pair of "I do" Uggs to keep her feet warm throughout the event. The most meaningful aspect of the evening for Travis and Allison was the emphasis on their commitment to each other. Rather than a first look, they shared a prayer together before the ceremony. Travis' eyes were closed so that he wouldn't see his bride, but the two felt closer than ever as they shared in their union and reflected on their happiness. 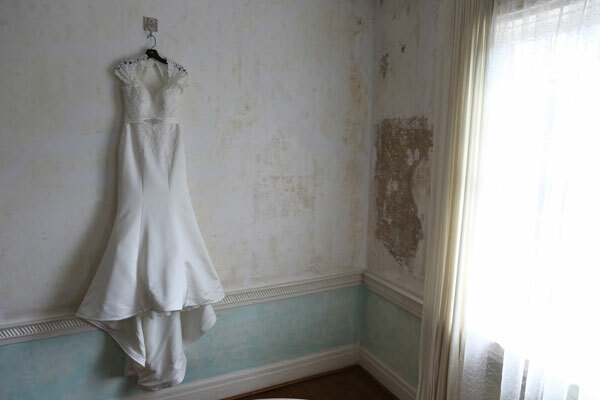 Be sure to see the Newcomb wedding on page 112 of the third issue of bridebook! Carmine and Crystal met while both interning for the same office in Washington D.C. They instantly hit it off and ended up sharing office space all summer. Though the two were very different--he was from Brooklyn, New York, and she was from a small town in Ohio--they felt as if they had known each other for a lifetime. They decided to continue their relationship even after they had to return to their separate law schools. After graduation, they were able to start a life together. Crystal ended up moving to Brooklyn with Carmine. When she moved, she took her beloved pit bull, Penny Lane, with her. This dog was particularly significant because Carmine got her for Crystal after her first dog died so that she would feel more comfortable living alone in Roanoke, where she worked for a brief period of time. As such, Carmine found a way to incorporate Penny Lane into the proposal. Carmine tied a ring box around Penny's neck while Crystal was in the shower. Then, Carmine told Crystal to sit on the couch so he could show her Penny's new trick. On command, Penny came in with the ring box around her neck. Carmine slipped the box off and proposed. The diamond in the engagement ring had belonged to Carmine's grandmother, which made the moment all the more special. Crystal and Carmine decided to have their wedding in Roanoke because of its convenient location and charm. It was a good meeting point for their families, who met each other for the first time on the day of the wedding. Crystal and Carmine were impressed by the gorgeous views their venue provided and the beautiful design of the event. Hues of purple and green brightened up the Vineyard and made the scenery pop. The bridal bouquet made the most of Crystal's bright color scheme. It was personalized with carefully-picked flowers and home-grown succulents that gave the arrangement a unique twist. The flowers were so perfect that Crystal had them preserved and framed after the wedding. The cake was also heavily coordinated with the floral design and wedding colors. Darlene Conrad, the cake designer, talked regularly with Lindsay Brown, the florist, to ensure that the floral arrangements on the cake fit perfectly. For cake toppers, the bride and groom chose cut-outs of their home states for a personal touch. 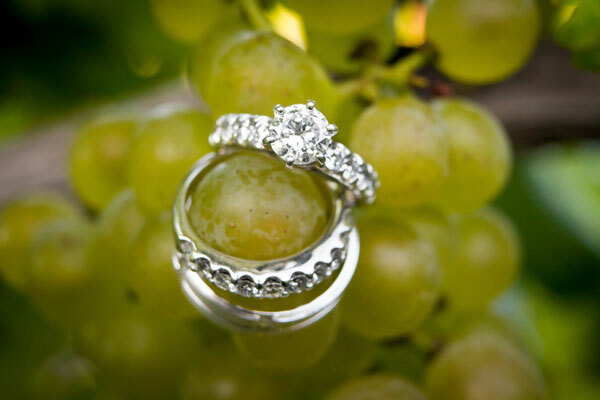 Crystal and Carmine love Valhalla Vineyards, and its rustic beauty required few alterations. Each table was decorated with milk glass vases and purple and green floral arrangements. The couple also hung photographs in vintage frames throughout the Vineyard, which allowed them to incorporate their dog, Penny, into the ceremony. For lighting, Carmine and Crystal used tons of votive candles to give the venue a warm and comfortable glow. The beautiful Blue Ridge Mountains ended up being the perfect backdrop for a destination wedding. Every guest was stunned by the Vineyard's picturesque views, and the blending of different families allowed for the couple to mix southern hospitality with city living. There was classic Italian food to represent Carmine's Italian heritage, and grits and fried green tomatoes to represent Crystal's upbringing. The couple shared their first dance to Pearl Jam's "Future Days" and thanked their guests by including gift baskets in their hotel rooms and giving out bottles of Valhalla wine. Carmine and Crystal wanted to make sure that their families and friends knew how much they were valued, and how great it was to have them travel so far for their special day. At the end of the ceremony, the couple placed love letters and a bottle of Valhalla wine into a time capsule that they will open on their one year anniversary. Be sure to see the Guiga wedding on page 92 of the third issue of bridebook!